“I think the approach we have taken at CSU to microgrids is different than what most universities have done,” said Zimmerle. “At most universities the microgrid work is entirely in the technical department. Our approach has always been cross-disciplinary.”However, technology isn’t the only answer to the challengassociate in the Energy Institute, says the key question is how to have socio-technical implementation of sustainable microgrids. 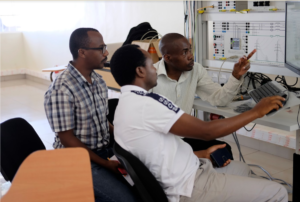 Therefore, the Smart Village Microgrid team is incorporating sociology and economic impacts into their research, and working with Rwandan schools and companies like MeshPower. Story originally seen in SOURCE, 11/9/18.